Pope Gregory the Great (590 to 604) transformed church administration, refined the practices of monasteries and wrote some of the most important Biblical commentaries of the middle ages, notably his 'Moralia in Job'. This manuscript is Volume 2 of a two-volume copy of the 'Moralia'. Made early in the 12th century, it belonged to the Cathedral of St Andrew at Rochester. The cathedral, named for the monastery in Rome where Gregory had begun his career, was founded in the early 7th century by Augustine, the missionary--also a monk from St Andrew's, Rome--whom Gregory had sent to Britain to convert the Angles. The medieval popularity of the 'Moralia' was due to its theme of personal, interior spirituality: how does one forge within oneself a Christian soul? The Book of Job, too, tells a great story. In this manuscript, each section of the 'Moralia' begins with a large historiated initial (first letter bearing a picture). 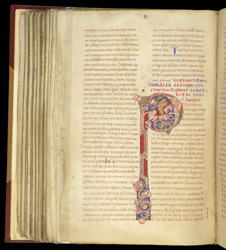 Book (section) 23 of the 'Moralia' begins with a large historiated P showing a knight spearing an imaginary creature whose body forms the letter's curve--with its tail becoming a nasty creature who bites the horse's leg--and head the serif of its vertical. At its lower end, the vertical sprouts an animal head which exhales a curving vine from its mouth. Letters made of fantastical animal forms appear in 12th-century Norman art and are typically Romanesque, while the historiated initial was most likely an Anglo-Saxon invention of the 8th century. The knight battling monsters could be seen as an image of Gregory's subject: the interior battle of the soul.